This charming farmhouse has four double bedrooms and 2 bathrooms. It is situated on the edge of a hamlet surrounded by beautiful countryside and has stunning views. Downstairs is a well fitted kitchen of a good size with dishwasher, fridge freezer, gas hob, oven and microwave and automatic washing machine. There is a shower room and toilet downstairs. The kitchen leads through to a wonderful large sitting room and dining area with a huge original Charentaise fireplace with wood burning stove making the house a delight during the winter. There is satellite TV a DVD player and a CD player and a selection of CDs. Also downstairs is a double bedroom with only 3 steps making it ideal for people who don't like too many stairs. Upstairs are three more good size bedrooms and a charming bathroom. The south facing garden has ample garden furniture and a barbecue. The LOVELY POOL is shared with guests at the Pigeonnier. Please see the comments from previous guests. The charming DETACHED FARMHOUSE has four double bedrooms and two bathrooms and is very well fitted with comfortable furniture. It is situated on the edge of a quiet hamlet surrounded by beautiful countryside and has stunning views. The property is south facing and is most attractive with open stonework, shutters and terracotta tiles to the roof, which is typical of the properties in this area. Summer offers fields of golden sunflowers, walnut orchards and vines. The farmhouse its own garden and there is a lovely pool. THE PIGEONNIER is unique. The lounge is on the first floor taking advantage of the great view and the wonderful beams giving an almost medieval feel. There are two bedrooms and one bathroom. The country style kitchen is very well fitted including a washing machine and dishwasher.There is modern heating throughout making this a comfortable retreat all through the year. The pigeonnier also has its own garden. THE LOVELY POOL is shared by guests at the two properties. There are many local restaurants but our favorite is The Chateau in Chalais which has elegant surroundings, excellent food and first class service. Ensure you book well in advance for this very reasonably priced treat.Two alternatives are Le Bonne Humeur at Yviers for wonderful fresh food and a friendly welcoming atmosphere and Le Passe Simple at Aubeterre. La Poirier in Bardenac serves an excellent and keenly priced lunch. Our information booklet give full details of local restaurants. Elderly or Infirm - There is a large downstairs bedroom in the farmhouse with just 3 steps making it suitable for folks who cannot manage a full flight of stairs. There is also a wash basin in this room. We stayed in this beautiful house for a week with two small children in July... it was perfect - the setting is absolutely breathtaking and the views are stunning - especially in July when sunflowers are in full bloom! The house was exactly what we needed for our stay and the pool was beautifully refreshing... was a good place to go and explore the local area and we took a trip to the beach on a couple of the days - simply perfect! Just back from a lovely week at The Farmhouse, we were two couples and one seven year old, plenty of room for us in this gorgeous old farmhouse, the lovely pool with beautiful views over the countryside was a real highlight. The pool is shared with guests at Le Pigeonnier but we didn't see them too often. House is in a small hamlet of about 8 houses, the nearest shop is 5-10 minute drive away so it really feels like it's in the middle of nowhere, very quiet and beautiful starry skies. A stunning Farmhouse with stunning views. We were a party of 12, three families two in the Farmhouse and one in the Pigeonnier. Six children aged between 13 and 9. Both house's were fantastic with plenty of space inside and out. In the Farmhouse the 3 rooms upstairs had plenty of space with a lovely family bathroom with the 4th bedroom just off the lounge and the use of a downstairs bathroom. The family of 4 in the Pigeonnier again had plenty of space. 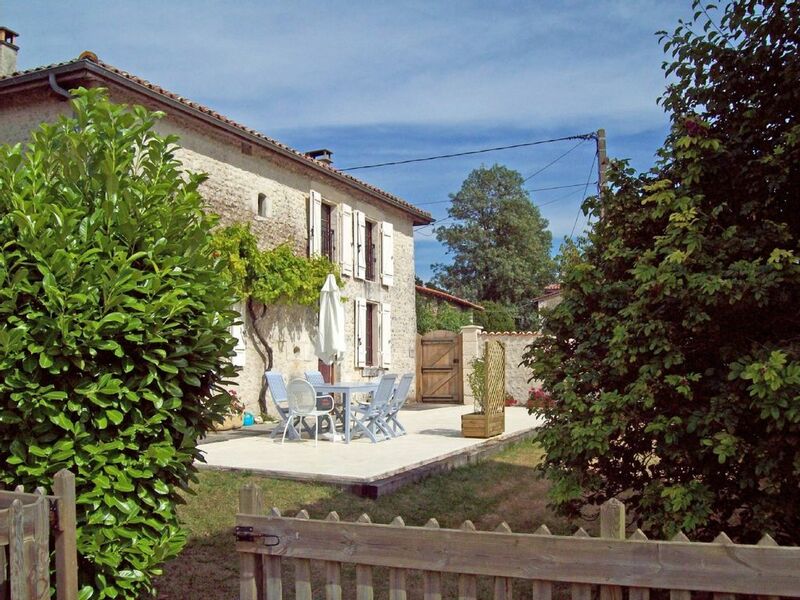 We were ideally placed with easy driving access to the towns of Chalais and Brossac. Also visiting the lake beaches in Brossac, Auberterre, Montguyon and the inflatables at Paradou well worth a visit. We also managed Tree climbing and kayaking in St Aulaye . A fabulous two houses in a great location. La Foix is an enchanting spot to enjoy a relaxing and recharging break. We stayed at Le Pigeonnier for 10 days in late May, and thoroughly enjoyed our time there. The owners have furnished the cottage beautifully, and all our comforts were catered for - great beds and bed linens, fully equipped kitchen The sitting room is the perfect spot to relax with a great book when the weather doesn't cooperate, with great views, a lovely stove adding to ambience, and two wonderfully comfy sofas. The property was beautifully prepared for our arrival. with an exceptionally thoughtful welcome basket and a lovely bottle of rosé chilling in the fridge! Every detail has been thought of to ensure a high level of comfort. Le Pigennier is a magical romantic little hideaway, with the great feeling of seclusion, while being close to everything you need; a great artisan boulangerie in Montboyer, and nice restaurants in the nearby villages. We travelled with two small dogs, and we all enjoyed beautiful walks each day. None of us wanted to leave! We will be back for sure! We absolutely loved this holiday ! We stayed at the Pigeonnier which was beautifully set in its own mature garden leading to the fab pool. The house itself is spacious , full of charming authentic character and fully equipped with everything you could need including exceptionally comfortable beds ! Lovely decorative touches complete the homely feel.We had our 2 children with us who , of course loved the pool but also loved escaping from the heat or relaxing in the evenings upstairs in the spacious sittingroom with views overlooking the surrounding sunflower fields , whilst we soaked up the lovely french heat relaxing by and in the pool. The pool area is very well supplied with plenty of sun loungers and umbrellas and even has its own pool house with a fridge for cool refreshments. The views from the pool are of uninterrupted french pasture ..sunflowers and the odd hot air balloon ! Our own garden had lovely outdoor furniture and a tree to climb with tree swing ! We visited the local village Chalais where we found everything we needed to stock the fridge and, on the owners recommendation ventured to Angouleme a beautiful french stone village quite closeby with a market full of interesting stalls and picturesque restaurants. highly recommended!! We spent a couple of evenings also at the nearby lake where there is a very good restaurant Quai Sud overlooking the little beach and lake area and some crazy golf and is a lovely setting for the families to walk , explore the woods or swim. We will definitely return and would be delighted to stay at either of these properties as the main house was so pretty also and had a gorgeous terrace too for enjoying al fresco breakfasts or leisurely suppers! Many thanks to the owners Peter and Jane for all their helpful information on the area and for letting us rent their beautiful property - a holiday to remember fondly! Wow, what a house! We had such a wonderful time here and would love to come back again! We came as a group of 4 couples and we also brought our 3 year old son. Having booked it without much input from the rest of the group I had got a bit worried that it wouldn't be what everyone wanted, but I had no need to worry. The Farmhouse is very secluded and private in the tiny hamlet of La Foix. But close enough to villages and towns that you do not feel completely isolated. The pool was a big hit with everyone (especially our son! ), and you never felt that anything was missing as it is so well equipped. The nearby village of Aubterre-sur-Dronne is well worth a visit or two with a beautiful river beach and lovely restaurants and cafes, very easy to spend the whole day and night! Brossac is also well worth a visit for the Lake at Etang Vallier! The boys also had a couple of games of Golf in Aubterre and we took a day trip to the Atlantic coast to Lacanau - Lovely! The hamlet of La Foix is near the village of Brie-Sous-Chalais in the beautiful South Charente. The town of Chalias where there is a supermarket, banks, petrol stations etc. about 7km away. The closest airports are at Bordeaux, Angouleme, La Rochelle and Bergerac. An hours drive will take you to Brantome, the Venice of the Perigueux or St Emilion, a lovely old town where you can visit the ancient vineyards by small train and sample the wine. 70 minutes drive takes you to a choice of wonderful beaches near Royan. Just a few minutes in the car will take you to a number of safe lakeside and riverside beaches with leisure facilities and lots to see and do. Drive further into the Dordogne and see the amazing Lascaux cave or the famous medieval town of Sarlat. Locally you can hire a kayak and paddle down river to a lovely restaurant and phone to be collected when ready. The attractive and interesting town of Aubeterre is just a 15 minute drive away. Other Activities: Just a few minutes drive will take you to a number of safe lakeside and riverside beaches with leisure facilities and lots to see and do. Golf: A short drive takes you to the beautiful Manoir de Longeveau Golf and Country club where you will find a 9 hole golf course in stunning surroundings. There are also tennis courts and a friendly bar and snack bar. The rates mentioned include: Gas and electricity during the summer months. Welcome hamper Bed linen and towels (not pool or beach towels). Rentals during the summer are Saturday to Saturday. However, this is flexible during low season. We offer discounts for late availability bookings and long lets.